This will be a short review, Candles Cafe is not a dumpling house but I was there recently and saw they had a dumpling appetizer. Candles Cafe is part of a local mini-chain of vegan restaurants that began back in 1984 with a combo health food store-juice bar and over ten years evolved into a vegan restaurant. Candles serves vegan-ized American Bistro style food, basically meat and two veg style dishes with the meat replaced with tofu or seitan. 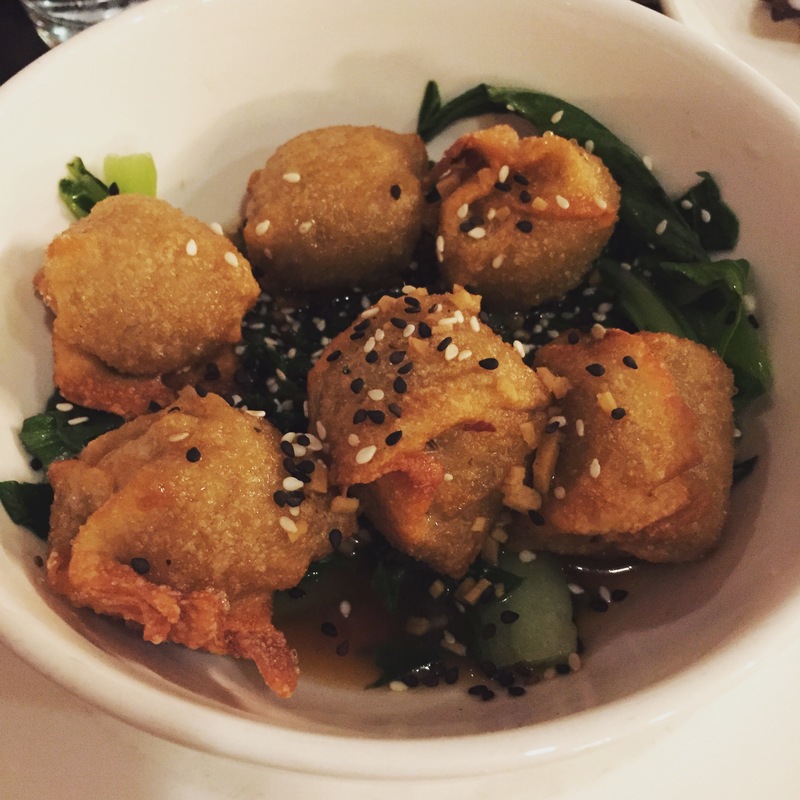 The Dumplings: The dumplings are filled with a mix of seitan, onion and leeks and are served in sauce with sesame seeds and wilted baby bok choy. 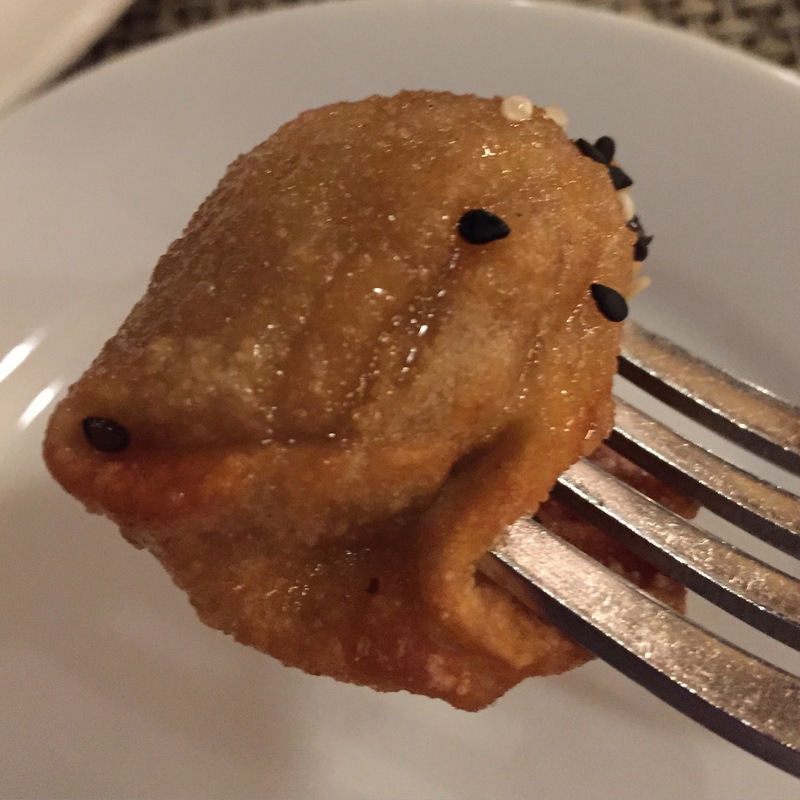 The dumplings were wrapped with a thick wonton style wrapper and the deep fried preparation reminded me of mini-egg rolls. Their taste and texture was vaguely meaty, but I disliked how the plating of the dumplings in the sauce made them quickly turn soggy and mushy. The best part of the dish was the wilted bok choy. The Sauce: The sauce was relatively thin but was heavily ginger flavored and, since the dumplings quickly became saturated with the sauce, after the first dumpling the rest just tasted like ginger. The Location: I hit the location on the Upper-West Side of Manhattan, on Broadway between 89th and 90th, there are two more locations on the Upper-East Side. This entry was posted in Vegan, Vegetarian. Bookmark the permalink.